The Cardiolund ECG Parser is a medical software product for automated rhythm analysis and categorisation of 1-12 lead ECGs. Robust estimation of standard ECG parameters in ECG signals. Categorisation of ECGs into clinically useful groups (12 categories: Poor Quality, No Rhythm Deviation, Irregular Sequence, etc. ), to enable presentation of sorted signals in a user interface. The ECG Parser provides analysis results as a machine readable data structure, and does not have a graphical interface. The software is intended for integration with medical systems, or mobile device user interfaces. The end users, such as clinical staff and patients, interact with the ECG Parser through the interface of the medical system and/or the device UI. The product features are described in more detail in the following. If you need more information on the EGG Parser product, or want to enquire about purchasing options, please contact us. Identifies beats and groups them into beat classes with different morphologies. Analyses the beat sequence in detail providing markers for a wide range of events. Calculation of standard measures such as Heart rate, RR variability, and the RR corrected QT interval (QTc) is included, as well as R tag and QT interval markers for presentation in a user interface. Performs robust interval measurements based on averaged beats, and categorises the signals or signal segment into one of 12 categories for efficient identification of important cases in large databases or important segments in long recordings. 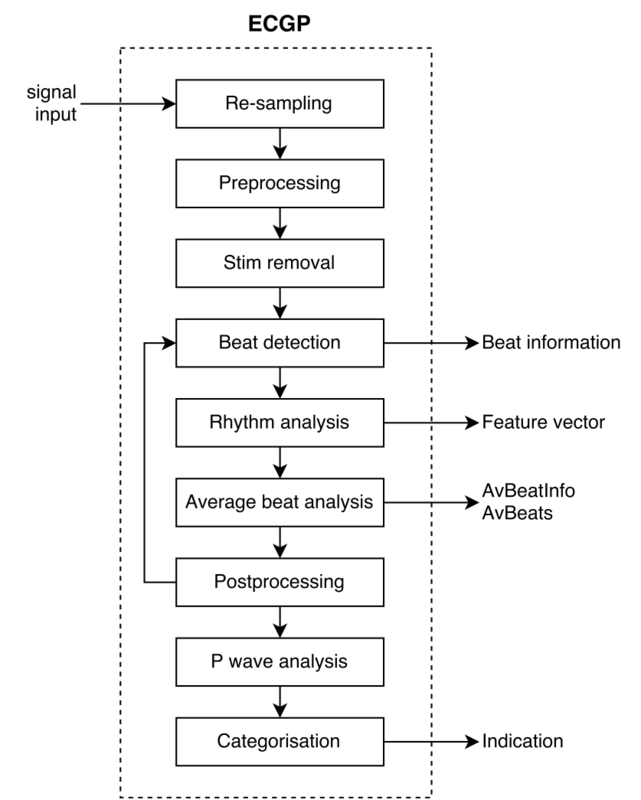 The parsing process produces a wealth of metadata decribing the contents of the recording, including the pre-processed ECG signal, average beats and associated measures, beat markers and beat classification, and markers and counters for short/long beats, SVES/VES, AV block II and longer pauses, faster or slower sequences, bigemini/trigemini as well as segments of irregularity. The metadata can be used for generating reports, creating plots of calculation results, and for display in a user interface. The output of the ECG Parser is provided in a machine-readable format, and it is therefore well-prepared for subsequent statistical analysis, and also for applying machine learning and articifical intelligence techniques. The ECG Parser is meant for integration with other software, and therefore it does not provide a graphical user interface, nor does it contain software for data capture and storage. The software can be customised and extended to provide different types of analysis reports, but it can also serve as an analysis platform supporting your device’s own user interface. The analysis reporting can be adapted to fit your specific requirements, e.g., localisation to specific languages. The analysis results of a signal also contain tags, filtered versions of the signal, and a detailed set of descriptors and markers for identified events in the signal. The metadata can be used to annotate the signal when displaying it in a graphical user interface, as shown in the following figures. Categories and tags can be used for prioritising resources during screening, since it allows the clinician to focus on the important cases, i.e., recordings classified as having a rhythm deviation. The clinician can thereby dismiss most of the recordings, namely all those classified as having poor quality, or as having no rhythm deviation. One of the main clinical applications of the analysis is screening of AF. When such screening is based on simplified home-based ECG measurements, the number of measurements is often very large, making it practically impossible to manually review all ECG recordings. The ECG Parser is well-matched to this application and fulfils an urgent need for software which can parse the signals and select a smaller group requiring further review. Integrating the ECG Parser in a screening system for diagnosis of AF requires that a subset of the above categories as the “AF indicator” is chosen; different choices are associated with different sensitivity and specificity. Clinical data, presented in this report, demonstrate how these two performance measures vary with choice of categories. When selecting a certain subset of categories as AF indicator, it is important to notice that, in clinical practice, AF is often grouped with other arrhythmias, in particular atrial flutter. Other important clinical applications include the detection of serial changes in recordings, the identification of common properties in signals from patient with the same end-state, the identification of patients responding to treatment, and the search for important events in the data records. Performs interval measurements with correct beat detection. Validated using the MIT QT database. Performs equally or better than reference systems available on the market in identifying AF from single-lead recordings. 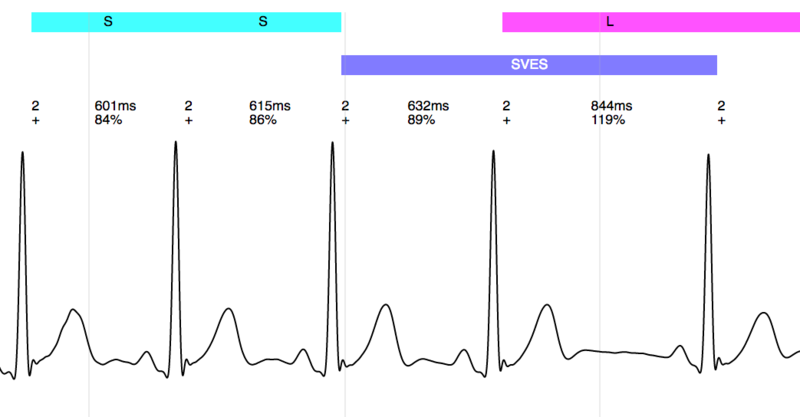 Classifies each segment into 12 categories representing the ECG signal content. The performance is measured in terms of specificity exceeding 97% for all rhythm deviation categories. Only heart rate (HR), QT-interval and category are validated in the ECG Parser output. Other output parameters may be used for indication only. Emma Svennberg, Martin Stridh, Johan Engdahl, Faris Al-Khalili, Leif Friberg, Viveka Frykman, Mårten Rosenqvist; Safe automatic one-lead electrocardiogram analysis in screening for atrial fibrillation. Europace 2016 euw286. The paper describes the results of the STROKESTOP screening study conducted on 3209 persons randomly selected among a large group of 78 or 79 year olds. The data set contains a collection of 80149 thumb-ECG recordings each 30s long, which were recorded using single-lead (lead-I) ECG recording devices created and marketed by Zenicor Medical Systems. The recordings were made twice daily over a period of 14 days, by the participants themselves in the participants’ own home and without any supervision or assistance. The performance of the ECG Parser algorithm for AF screening is evaluated on the data set against a gold standard of manual review. The reported performance results are listed in the summary table, in the main report. In the referenced paper, the ECG Parser category set of categories 2-8 and 10-11 are used as AF diagnostic indicator. The study concludes that no AF case is missed in the screening process using these ECGP categories as AF diagnostic indicator. Performance results, also with regard to the STROKESTOP data set, for other choices of category sets for AF indication can be provided by Cardiolund on request. Cardiolund has also performed an additional performance assessment of the ECG Parser with regard to categorisation of recordings into the 12 categories based on a sub-set of the STROKESTOP data set, and on additional clinical assessment. The performance of the algorithm depends to a large extent on the signal quality of the input signal and may therefore vary between different systems. The AF screening performance has been evaluated using the 80k signals in the STROKESTOP study measured using a handheld Zenicor ECG device. For this dataset, an AF sensitivity of 100% on a signal/patient level is achieved with a specificity of 88%. The categorisation performance has been evaluated using 4k signals measured using a handheld Zenicor ECG device. For this dataset, the categorisation has shown to be indicative of important clinical characteristics of the signal. The interval measurement performance has been evaluated using the Physionet QT database. For this dataset, the average errors in QRS complex and T wave onsets and offsets have been shown to be acceptable. The ECG Parser is CE-marked as a medical device software product for automated interpretation of 1-12 lead ECGs. The software can handle varying levels of signal quality, ranging from poor-quality single-lead ECGs acquired with mobile devices, to high-quality 12-lead recordings. The ECG Parser is is not a complete diagnostic software, neither is it intended for real-time applications, nor for interpretation of life-threatening cardiac diseases. The ECG Parser is medical device software classified as Class IIa on the MDD classification scale, and as Class B (Non-serious injury possible) on EN IEC 62304 classification scale. 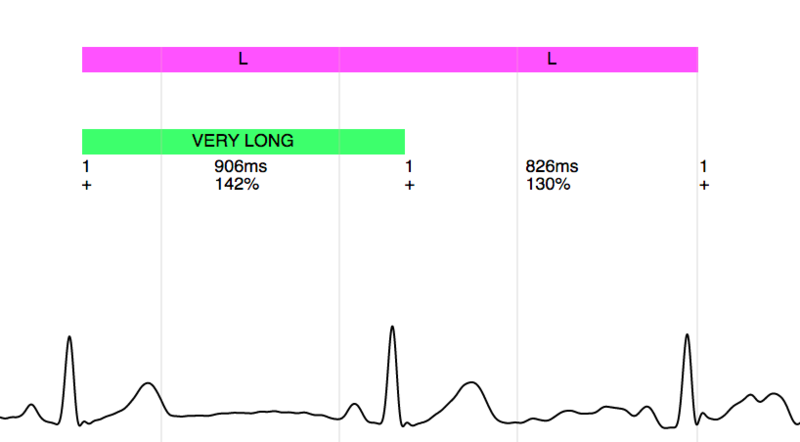 The ECG Parser is only intended for analysis of ECG signals recorded on humans. The software may be used for analysing ECG signals recorded on children when the results are first reviewed by trained professionals. The software is not suitable for analysis of ECG signals recorded on animals. Finding irregularities in beat sequences in the presence of the disturbance patterns which are associated with lower quality ECG measurements. Not missing any important cases and, at the same time, significantly reduce the required review effort by a trained cardiologist. Re-sampling is done to adjust the signal to the internal sampling rate of the algorithm. Preprocessing is done to remove disturbances that may disturb the beat detector. Stim detection and removal is done to remove pacemaker spikes that may disturb the beat detector. Beat detection is where all individual events in the signal are found and identified in terms of morphology. Rhythm analysis is where all individual events are summarised into descriptors of the rhythm pattern. Average beat analysis and Interval measurements is where all intervals (standard ECG measures) are calculated. Postprocessing is an evaluation of possible problems that have occurred during the analysis. Some problems are solved by rerunning the analysis from step 4 with changed settings. P wave analysis done to identify if P waves are present which supports the following categorisation step. Categorisation is the final step where all different features of the signal are summarised into a decision on which category the signal belongs to (Poor Quality, No Rhythm Deviation, Irregular Sequence, etc.). The following diagram provides an overview of the information flow through the steps of the algorithm. Detailed technical specifications are availble on request. If you want more information, or have any questions, please contact us.